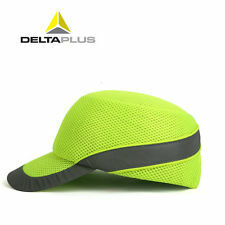 Impact resistant baseball style bump cap. Adjustable by a buckle from 55cm. to 62cm. Highly ventilated lightweight polyethylene shell with 18 holes and covered with an airmesh fabric to keep a cool head. Comfortable polyethylene and EVA foam shell for shock absorbtion. Bump caps are intended for use when there is a significant risk of impact between the head and stationary objects, such as low ceilings. Where there is a significant risk of impact with moving objects of any type, an industrial safety helmet should be used. A bump cap is to protect the head against impacts, an impact protection test is included as a mandatory requirement. This is carried out by mounting the bump cap onto a fixed headform and then impacting it with a vertical falling mass.